GoWild Casino adds a bit of elegance to the world of online gambling and with the software from Microgaming, it keeps players entertained at all times. Hundreds of games are available and the promotions are very attractive to new and existing customers alike. GoWild Casino encourages players to unveil their wild side of gaming and make sure they have as much fun as possible with the hundreds of pokies and the other games. There is no need to worry however since all of this is done in a regulated environment with secure banking and responsible services. It is based in Malta and licensed by the Gaming Authority here to make it a legit choice in Australia. The software from Microgaming makes for perfectly fair games and plenty of them. It is possible to download the software from the website or opt for the Flash version and play from the browser. Whatever the choice, real money betting and practice play modes are provided and the customer support team is always ready to lend a hand if needed. The casino online doesn’t quite have a standard welcome bonus. While it has an offer of 100% up to AU$200 on the first deposit, it is also joined by 2,000 Loyalty Points and an invitation to the GoWild $350 Welcome Free Roll Tournament. Players from Australia can choose to not get the free money and opt for 200 free spins on SunTide instead. Also, just by registering an account, the casino will offer 500 Loyalty Points for free, which is enough to reach the first level in the reward program. Special promotions include a 50% booster bonus available on every Monday, an early bird offer of 100 free spins and a 50% bonus up to $100 and more. The full collection from Microgaming is available in Australia and can be accessed by downloading and installing the premium software. There are a few more games available on this version of the software than there are on the Instant version so it comes recommended by the casino and by our team of experts. Of course, most of the big titles are available on the site as well and the lobby keeps the elegant black design of GoWild Casino. GoWild Mobile will connect players from Australia with their favourite games from the casino. The collection has over 70 titles available and they include the popular pokies like Thunderstruck, Mega Moolah, Immortal Romance and more. Roulette and blackjack are also available on mobile devices and the casino will add tailor-made promotions for those betting from a smartphone or tablet. The mobile casino doesn’t have downloadable apps and instead provides a version of the website that will change automatically when going to it from a compatible device. Android phones and tablets, iPhone and iPad are the ones used most frequently. The mobile account has a full cashier with most of the deposit options and an extra one exclusive to mobile payments known as Zimpler. In fact, if you are now browsing the collection of games on the website on your desktop computer, you will see that quite a few of the top pokies have a smartphone logo in the top right corner and this is there to let you know that you can switch to mobile and still enjoy the same level of wild gaming action. Crossplay: Yes, if you already have an account, you can use it to login from your mobile device. $200 or 200 free spins is a choice that can be made on the first deposit at GoWild Mobile Casino. The spins are available for the hit slot SunTide and the welcome package also includes 2,000 Loyalty Points. While the version for computers can take some time to set up due to the application, GoWild Mobile Casino is easy and to the point. It has big buttons for registration and for signing in and most importantly, no app is needed. The casino accepts multiple currencies but some payment methods can be limited to only a few. Overall, AUD is available and so are CAD, SEK, USD, NOK, EUR and GBP. The top part of the website will always be available when navigating the online casino and this has the option to select the language. English, German, Spanish, French, Italian, Norwegian, Portuguese, Russian, Swedish and Turkish are all available. Customer support is also very well organized and open 24 hours a day, 7 days a week. Live chat is the contact option preferred by most players nowadays but the casino also provides several email addresses and phone numbers for the main markets. Australia is of course on the list and gets a toll-free landline. If the standard bonus covered in the GoWild Casino review is not big enough, you can opt for the High Roller bonus of 50% up to $1,000 on the first deposit as long as the payment is between $500 and $2,000. There are also many rewards on the list of Achievements. Players just need to bet real money on the listed games to unlock hundreds of free spins, thousands of loyalty points and more. 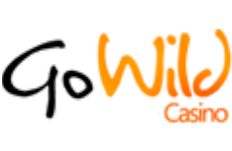 And since we mentioned loyalty points a few times throughout the online casino review, we should also talk a bit about the GoWild Rewards Program. It has six levels and the casino uses loyalty points from real money bets to determine where each player is every month. Needless to say that being on a higher VIP level will result in better bonuses and benefits. Overall, GoWild really is a complete online casino. It has a lot of bonuses and promotions to make sure the players feel appreciated and the games from Microgaming are always great. And even with just one developer network available, the list has more than 500 options from the downloadable software and that is more than enough for most gamblers. The banking system is great but it does take a bit too long to get withdrawals processed. Customer support is readily available at any time and this includes when playing on the mobile casino. In conclusion, join GoWild Casino today and you will not regret it. Play at GoWild Casino with your $200 Bonus Now!